Historically there was always been an equilibrium in London between people who have settled to make the city their own and the making money; but now we are in an age when areas are being taken over by big business under the guise of regeneration and the indigenous population literally forced out of the city for investment flats that will remain empty. This work concerns a subject close to my heart, because the Elephant and Castle, is an area where I live and where my family roots have been for the past 200 years, which has made me feel the need to speak up in some way! 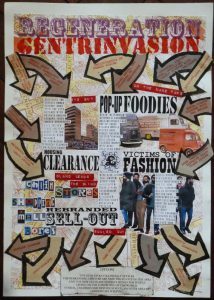 The work is a collage of lettering and photos reminiscent of a 1980’s cut and paste political poster or fanzine, done to provoke and shake up people, to see what is happening and how the masses are manipulated, buying into the clichés, straight into the arms of big business. It does in some way, ‘Bite the hand that feeds’, but it does have a serious political message about London now. First the indigenous population are evicted and moved out of the city; families, the old working classes, ethnic minorities, people on benefits, the elderly, disabled etc. The council banner of redevelopment hides its intention to cleanse the area of its financial obligations, but the flats will be marketed in the Far East to bring in trouble free owners, who will probably never live in their investments. Pop-up Shops, Street food, Citroen H Vans, Piaggio Mobile Coffee Scooters, Farmers Markets with over-described and over-priced food, Cup Cakes, Cocktails served in jam jars, Pointless Art projects. 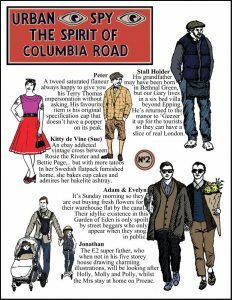 In come the White Middle Classes from the ‘Shires’, dressed as 19th century lumberjacks and vintage pin-ups turning the area into their post ironic playground for Urban Wannabes. 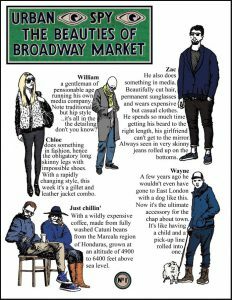 An imperious fashion of beards, quiffs, skinny jeans, toy dogs, tattoos, exposed brickwork, industrial lights; a rosy tinted ‘back in the day’ view of life that never existed to replace the history and community that has been lost. Vintage Keep Calm and Carry On Fakery all whipped up by social media. Ironically, they are all destined to be priced out of the area as they are just re-branding the area for big business. Just self-indulgent little marionettes unaware of their puppet masters. Newly completed tower blocks are now called, ‘High Rise Urban Living’. The “New Public Spaces’, privately owned and patrolled by security guards, provide a token gesture to the community destroyed. The high street chains add some more blandness to another piece of identikit Britain. The overseas buyers have bought the flats as investments because their indigenous banking systems are unstable, but their relatives who stay once a year for the weekend will love the quirky, vintage, typical Englishness of this prime Zone 1 location. Another area of London has died, devoid of history, community and soul; the inheritors of London will be left empty handed.